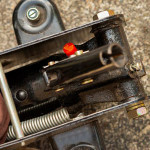 Whether you’re replacing your brake pads for the first time or need to change a flat tire when you’re on the road, learning the right way to use a car jack is something every car and truck owner should know. Jacking up a vehicle is not something you want to use trial and error on. 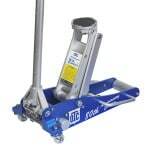 The process below describes how to use a floor jack as well as how to use jack stands and where to place them. Anytime you’re lifting up something that weighs a couple tons or more and then getting underneath it, safety is of utmost importance. Never work under a car that’s not supported by jack stands. Seals on a hydraulic jack may leak/fail or an accidental bump of the handle can cause the car to be lowered on top of you. Always chock the wheels on the opposite axle. Don’t assume your vehicle will not roll when one end is lifted up even if you think you’ve taken all precautions. Avoid using a scissor jack unless for a roadside emergency. Scissor jacks are meant for emergency use only and are too weak and unstable to use on a regular basis. The very first thing you should do is make sure your vehicle is on a smooth, level surface with enough room to comfortable work around. For most, this will be either inside their garage, a non-sloping driveway, or the street. Any type of slope will cause your car to lean on the jack stands which may cause them to tip over. Important: Do not jack up your car on gravel, dirt, grass, and other uneven or soft surfaces. The risk of serious injury to yourself or damage to your vehicle is HIGH. After moving the car into position, put the car in Park (automatic transmission) or first gear (manual transmission). If raising the front wheels off the ground, set the parking brake and place wheel chocks behind the rear wheels. If raising the rear wheels off the ground, the parking brake will have no effect so it’s critical to place a set of chocks in front of the front wheels. A second set behind the front wheels is even better. Note: If you’re in a pinch and don’t have wheel chocks, cinder blocks or 4×4 blocks of wood can be used as a substitute (but rubber wheel chocks will be the most secure). 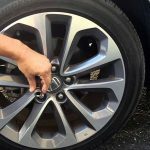 If you plan on removing a wheel whether it’s to change a flat or work on the brakes, you’ll want to slightly loosen each lug on the wheel you’ll be removing. 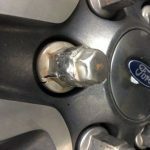 This avoids any issue of the wheel spinning if you’re trying to loosen the lugs while the vehicle is already off the ground. The best way to find the factory approved jacking points for your vehicle is to look in the owner’s manual or Chilton or Haynes service manuals. Usually, jack points are located along the frame rail on each side of the vehicle as well as front and rear crossmembers or rear differential (for trucks and other RWD vehicles). Again, the owner’s manual is your best bet since each vehicle is slightly different. Note: The jack points for a scissor jack will always be on the pinch welds behind the front wheel and in front of the rear wheel that are located on the frame rails along each side. After you move the floor jack into position, make sure the hydraulic valve is closed and SLOWLY pump the floor jack’s handle downward to lift the saddle of the jack upward until it makes contact with the jack point. Continue slowly pumping the handle until the car is lifted to the desired height. 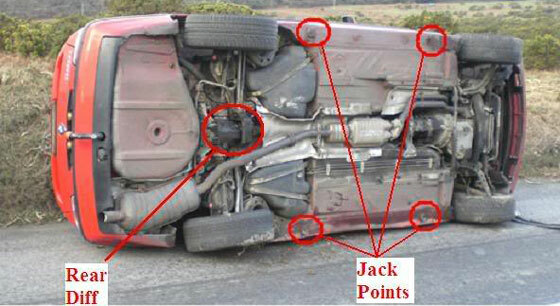 Be aware of any shifting or damage to the jack point on the car. If at any point something doesn’t feel right, stop and slowly lower the car. 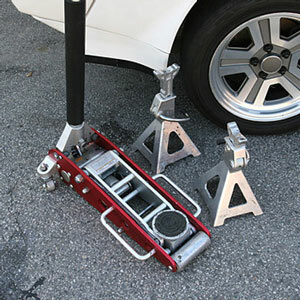 There could almost be a separate write-up on how to use jack stands since the approved jack stand points can vary quite a bit by manufacturer and even model. Once your vehicle is jacked up to the correct height, place a jack stand under the approved point (see your owner’s manual) and repeat for the wheel on the other side of the car. These jack stand points are most often the same notches on the side rail that the scissor jack would go into. Make sure all jack stands are adjusted to the same height. Jack stands should always be used in pairs. Note: As an extra precaution, if you have removed a wheel, place it flat underneath the side of the vehicle as simple insurance in case of the rare event that a jack stand fails. After the jack stands are in place, slowly lower the vehicle so it’s sitting on top of the jack stands. With a floor jack, this is most commonly done by slowly twisting the handle counter-clockwise which opens a valve to release hydraulic fluid which in turn lowers the floor jack’s saddle. Once the jack stands take up the vehicle’s weight, raise the saddle so it just touches the car. This will be another simple insurance policy in case a jack stand fails. Before you get under your car and start working, take a step back to look things over. 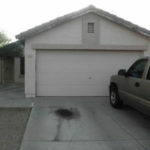 Push on the vehicle or try to rock it and pay close attention to any unwanted movement or instability. When you’re getting underneath a couple tons of metal, you want to be 100% sure everything is stable. This quick safety check and literally be the difference between life and death. As mentioned earlier, a scissor jack is not meant to be used on a regular basis as its main purpose is to bail you out if you have a flat tire when out on the road. All things considered, it’s weak and highly unstable. If used too many times, especially on a rough or slightly sloped surface, it’s almost like playing Russian Roulette. If you absolutely must use a scissor jack, the process on how to lift a car is almost identical except for the differences in jack points as noted in step 4 above. 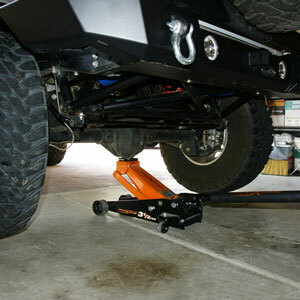 Besides the safety factor, the other issue you would encounter is where to place the jack stands. 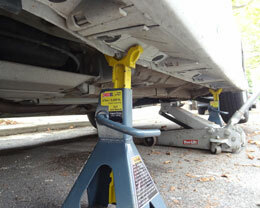 Scissor jacks have a much shorter max lift height so you will find that most jack stands are too tall to fit under your car even at the lowest setting. Since you are using the pinch welds as the jack point, the stands will require more clearance as you have to fit them a bit further under the car. There are other jack points underneath the vehicle and one of them that many home mechanics use is the rear diff. The differential is designed to carry the load of your vehicle and should have no problem supporting your vehicle while in the air. Doing this does come with some increased risk, but having the proper equipment and tools will allow you to accomplish this and do it safely. 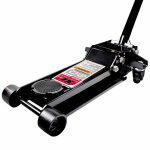 If you’re going to use the rear differential to jack your truck up you will need a decent quality hydraulic floor jack and jack stands that are rated for the weight of your vehicle. To get the job done, and be as safe as possible while doing it, there are a few things that you should consider beforehand. As always, ensure that you’re on a flat level surface, as you should never jack a vehicle up on a hill or incline of any sort. Before getting the rear end of the vehicle in the air, ensure that you use wheel chocks in front of the front tires so there’s no chance of the vehicle rolling forward and falling off of the jack before you’re able to get the jack stands in place. Also, use a floor jack as a bottle jack will most likely not have a large enough jack pad to safely support the vehicle when lifting from the rear differential and the bottle jack’s handle will generally be shorter which is no good for this purpose. Also, ensure that the jack has a rubber boot or some sort of padding on the lifting point and if it doesn’t you can use some extra shop rags to keep from scratching or gouging your diff. You should take extra caution to ensure that the jack has good contact with the differential and that no part of the jack is putting pressure or is in contact with the differential cover that is usually made from aluminum that could be easily damaged in this process. 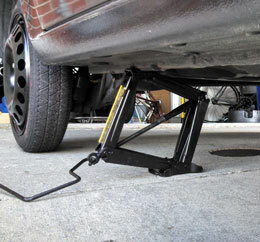 Once you get the vehicle up in the air, place your jack stands under the vehicle before you perform any maintenance. Using a little bit of patience and common sense can go a long way when performing any kind of vehicle maintenance. Hopefully this will give you just a bit more confidence and the reassurance that you can indeed jack your vehicle up using the rear differential and you can do it safely. Nice job explaining how to jack up a car, especially for those who haven’t done it before. It’s really not that complicated but I’m glad you went into detail. Apart from designated lifting points where else can you support the car, front suspension, rear axle etc? It’s best to check out your owner’s manual for your vehicle’s specific recommended jack points. If you don’t have your manual, Google “jack points for [vehicle model]” and go to the Images tab in the results. But generally speaking, the pinch welds on sides (under the doors), any part of the frame, or center of the rear diff.